Each user can access your system with their login credentials. There are 3 different types of users, explained below. User settings can be found under the Users menu. On the Users page, any previously added users will be listed. To add a new user article, click the green "+ Create User’ button at the top of the page. Below is an explanation of the fields on the New User details page. The * fields are required for all users, the rest of the fields are optional. The username the user will use to login to the site. The password for the user to login to the site. When setting a user account up for someone you can just use a temporary password and instruct them to change their password after they have logged in. Only applicable and visible for users set to an Editor role. Select from the drop down list which users you would like to approve the content before it is published to the site. For more information on custom content approvers, click here. 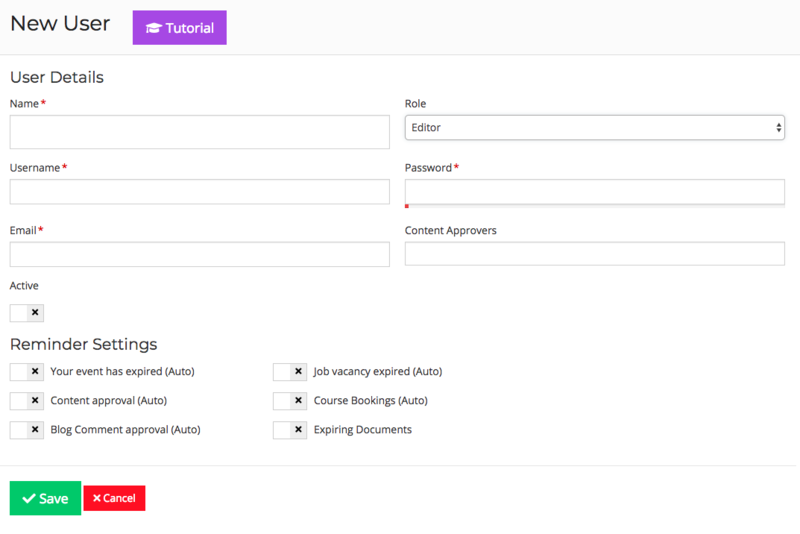 After creating a user they will by default not be able to see any of the administration options for your site, set user permissions to give them access to the site. For help on setting user permissions please click here.